Farm Tubs may be purchased as Farm Tub Planters with integrated self-watering system or as Farm Tub Do It Yourself (DIY) Self-Watering Kits to retrofit planters, containers and stock tanks. Ranging from three to eight feet long, Farm Tub Planters are an ideal alternative to raised beds and small containers and are well-suited for greenhouses, decks, patios and gardens. Decorative and functional, Farm Tub Planters and Kits utilize a water reservoir and capillary wick system, is easy to manage, and self-irrigates once plants are established. For effectiveness, the system requires the use of a high-grade potting soil, such as Black Gold Natural and Organic Potting Soil. While a Farm Tub may look like a regular planter once the potting soil is added, under the surface is a self-watering system that saves time and conserves water. To set up, spacers are placed on the bottom of the planter or container to hold a planting platform aka reservoir top, creating space for a water reservoir below. Wicks designed for gardening applications are threaded through holes in the platform. Potting soil is spread throughout the planter and the wicks are feathered in all directions to maximize watering coverage. A fill tube with a water-level indicator float helps monitor the amount of water in the bottom of the planter or tank. 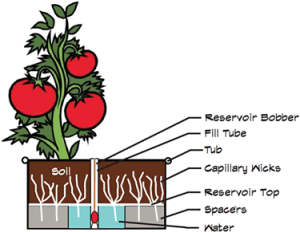 Once set up, there is a layer of water in the reservoir beneath the soil layer. Through capillary action, the wicks pull the water from the reservoir up to the root zone of your plants, thus watering from beneath. The benefit is that the plants self-water and only take up the amount of water needed. With the reservoir beneath the soil, you also conserve water as you have the evaporation that you do with top watering. This saves time and is a more efficient way to water. The reservoir is filled every 10 days to 2 weeks depending on conditions and what plants are being grown. For vegetables, it is recommended Farm Tub Planters are located to receive 7-8 hours of directly sunlight. Farm Tub growing systems are available as either a Farm Tub Planter in wood veneers or plain galvanized steel or sold as a DIY Self-Watering Kit to convert any water tight container or stock tank into a self-watering planter. Farm Tub LLC is a Boulder, Colorado company dedicated to the fresh food movement by making it easier for people to grow their own food. 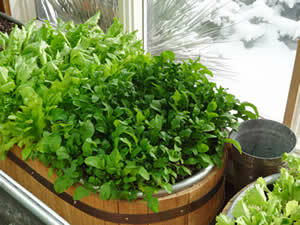 For information and pricing, please visit www.farmtub.com and www.facebook.com/farmtub.